We are a Finnish company supplying advanced technical solutions, professional engineers, skilful manpower and foreman services to the Construction and Oil & Gas industries. The Scandinaval Group comprises of four operating companies. 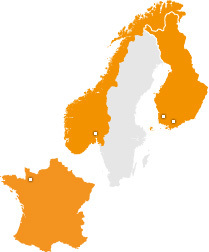 We are represented by independent subsidiaries in Norway and France, but our markets are global. The Scandinaval Group is technically adept in major projects requiring stringent safety standards and specialist knowhow. We advocate reliable partnerships and long lasting client relationships which are sustainable, honest, ethical and transparent.